Growth in mobile ad spend outpaced growth in total online revenue by a factor of ten to one during the past financial year, as the online ad industry cracked $3 billion for the first time. According to figures released by the Interactive Advertising Bureau Australia (IAB) total online advertising increased 21% year on year to reach $3.136 billion over the 12 months to 30 June, while mobile ad spend reached $47.5 million, a 212% increase. The end of year figures mark the first time mobile has been included in the reporting and show the cost effectiveness of the approach, says Paul Fisher, CEO of IAB Australia. “The growth in mobile advertising over the past six quarters shows that for a minor investment relative to TV, print and other media spends, marketers can add mobile audience reach and executions to their online search and display campaigns,” Fisher says. 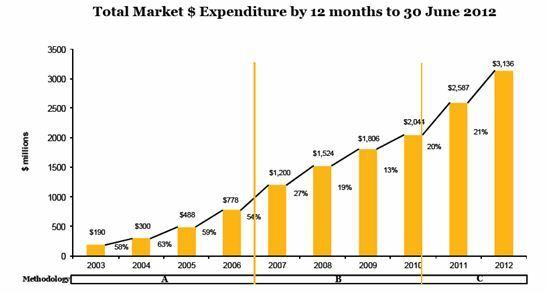 Compiled by PricewaterhouseCoopers (PwC), the ‘Online Advertising Expenditure Report’ shows search and directories continue to dominate the sector taking a 52% share of spend, or $1.639 billion, a 30% year-on-year increase. Classifieds holds 21% of the market’s value ($643 million) and increased 11%, while general display reached $853 million (27% of the market) with a 15% increase. Of mobile advertising, general display advertising accounted for 60% and search advertising accounted for 40% for the three months ending 30 June. Smartphone advertising accounted for 68% while tablet advertising accounted for 32% of this spend. The June 2012 report also included estimates for Google and Facebook, adopting a new approach which collected data collected industry participants. Historical mobile advertising data collected from industry participants from March 2011 was combined with estimated Google mobile advertising, to give a picture of the aggregated mobile advertising market and growth trends. Comparative data for the period from September 2010 has been restated to be consistent with the methodology changes. The IAB predicts online advertising will surpass free TV in calendar year 2013 and print in the 2013-14 financial year.